We just got home from vacation. Long car trips are nice in a way. We get to see some of the beautiful countryside and talk. We listen to oldies music and eat junk food. On the trip home this time I thought of a cute idea for a snack container for kids! My boys are adults and clearly don’t need anything like this now but when they were little, this would have been perfect! On our trip I bought a few containers of gum by Wrigley’s Eclipse. ($3.99) Each plastic container holds 2.9 ounces of gum and fits into a car cup holder. One side of the flip lid dispenses the gum a piece or two at a time. And the other side of the lid dispenses larger pieces or more gum. And the cap screws off completely! It makes a perfect snack container! Come to think of it, my husband and I like to eat trail mix on trips and this would be a much neater and easier way to eat it while driving or on a trip. I love it when I am able to recycle AND repurpose something! Have a wonderful day, everyone! 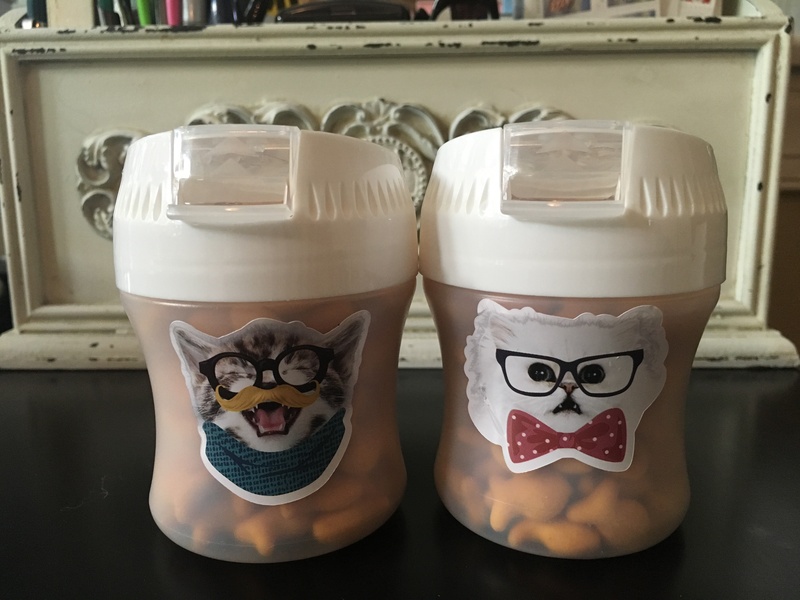 *** The cat stickers seen here are by Stico and called Hipster Cats for $1.49 for a pack of 8. The alphabet stickers were by Recollections for a pack of 267 upper and lower case glitter letters were $4.99. Fall decorations-Let the games begin!